Established in 1988, the International Presentation Association (IPA) is a network various congregations of Sisters of the Presentation of the Blessed Virgin Mary around the world, formed to foster unity and to enable collaborations for the sake of mission. Flowing from their identity as Presentation women the mission of IPA is to channel their resources so that they can speak and act in partnership with others for global justice. In carrying out this mission, they nurture a contemplative stance. 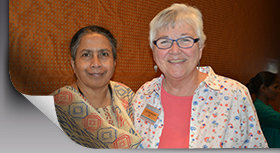 Every four-to-five years leaders from Presentation congregations around the world meet to discuss how they can collaborate and communicate to more fully embody Presentation mission and charism. They continue to strengthen their justice network to work for structural change especially in issues related to women and children, indigenous peoples, environment/sustainable living and human rights. They continue to develop the most effective means to use their non-governmental status with the Economic and Social Council at the United Nations and work with other local, national and international people's movements and organizations which work for structural change. They are committed to solidarity in mission through the sharing of personnel, finance and other resources.